Forty-four states levy a corporate income tax. Rates range from 3 percent in North Carolina to 12 percent in Iowa. Six states — Alaska, Illinois, Iowa, Minnesota, New Jersey, and Pennsylvania— levy top marginal corporate income tax rates of 9 percent or higher. Seven states — Arizona, Colorado, Mississippi, North Carolina, North Dakota, South Carolina, and Utah — have top rates at or below 5 percent. Corporate income taxes are levied in 44 states. 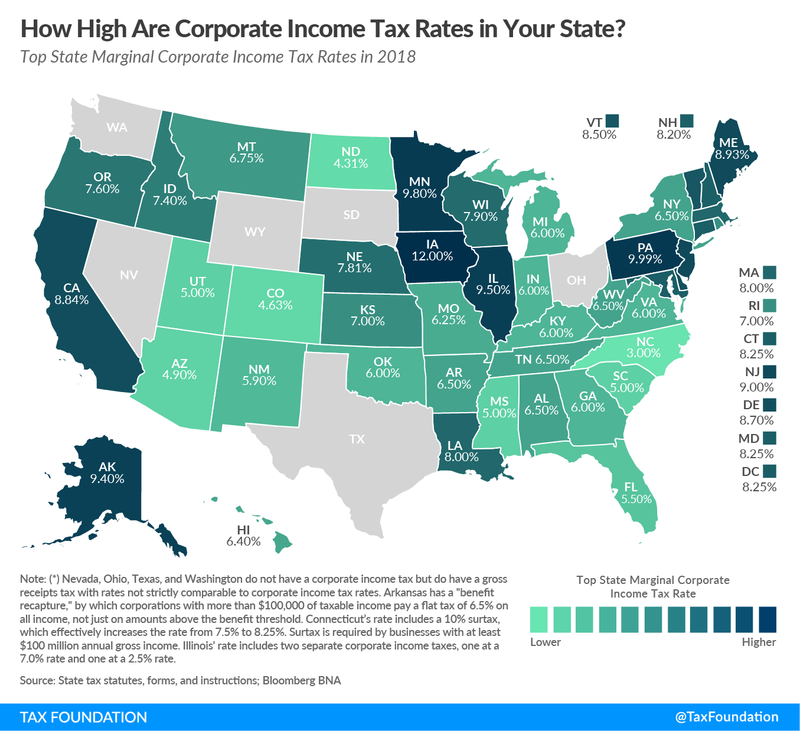 Though often thought of as a major tax type, corporate income taxes account for an average of just 5 percent of state tax collections and 2.6 percent of state general revenue. Iowa levies the highest top statutory corporate tax rate at 12 percent, closely followed by Pennsylvania (9.99 percent) and Minnesota (9.8 percent). Three other states (Alaska, Illinois, and New Jersey) levy rates of 9 percent or higher. Conversely, North Carolina’s flat rate of 3 percent is the lowest rate in the country, followed by rates in North Dakota (4.31 percent) and Colorado (4.63 percent). Four other states impose rates at or below 5 percent: Arizona at 4.9 percent, and Mississippi, South Carolina, and Utah at 5 percent. Nevada, Ohio, Texas, and Washington forgo corporate income taxes but instead impose gross receipts taxes on businesses, generally thought to be more economically harmful due to tax pyramiding and nontransparency. Delaware and Virginia impose gross receipts taxes in addition to corporate income taxes. South Dakota and Wyoming levy neither corporate income nor gross receipts taxes. In Connecticut, businesses have long faced a 20 percent surtax on top of the state’s 7.5 percent corporate income tax rate, bringing the top marginal rate to 9 percent. Effective 2018, the surtax dropped to 10 percent, bringing the top marginal rate to 8.25 percent. The District of Columbia reduced its corporate income tax rate from 8.75 to 8.25 percent as the final part of a 2014 tax reform package. Mississippi began phasing out the 3 percent corporate income tax bracket by exempting the first $1,000 of income this year. The 4 and 5 percent brackets will remain. The tax rate in Indiana will decrease to 5.75 percent on July 1, 2018. (a) In Arkansas, corporations with net income over $100,000 pay 5.4 percent on the first $100,000 plus 6.5 percent on the excess over $100,000. (b) Rate includes a 10% surtax, which effectively increases the rate from 7.5% to 8.25%. Surtax is required by businesses with at least $100 million annual gross income. (c) Nevada, Ohio, Texas, and Washington do not have a corporate income tax but do have a gross receipts tax with rates not strictly comparable to corporate income tax rates. See Table 18 for more information. Delaware and Virginia have gross receipts taxes in addition to corporate income taxes. (d) Illinois’ rate includes two separate corporate income taxes, one at a 7.0% rate and one at a 2.5% rate. (e) The tax rate in Indiana will decrease to 5.75% on July 1, 2018. (f) Corporations with entire net income greater than $100,000 pay 9% on all taxable income, companies with entire net income greater than $50,000 and less than or equal to $100,000 pay 7.5% on all taxable income, and companies with entire net income less than or equal to $50,000 pay 6.5% on all taxable income. “State & Local Government Finance, Fiscal Year 2015,” U.S. Census Bureau. https://www.census.gov/govs/local/. Justin Ross, “Gross Receipts Taxes: Theory and Recent Evidence,” Tax Foundation, Oct. 6, 2016. https://taxfoundation.org/gross-receipts-taxes-theory-and-recent-evidence/. 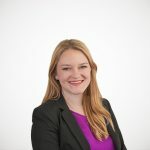 “Sweeping Connecticut Tax Reforms Passed by the General Assembly,” Deloitte, June 5, 2015. https://www2.deloitte.com/content/dam/Deloitte/us/Documents/Tax/us-tax-mts-alert-sweeping-Connecticut-tax-reforms-passed-by-the-general-assembly.pdf. Joseph Bishop-Henchman, “D.C. to Enact Remaining Tax Cuts After Projection of Large Recurring Surplus,” Tax Foundation, Feb. 28, 2017. https://taxfoundation.org/dc-enact-tax-cuts-large-surplus/. Joseph Bishop-Henchman, “Mississippi Approves Franchise Tax Phasedown, Income Tax Cut.” Tax Foundation, May 16, 2016. https://taxfoundation.org/mississippi-approves-franchise-tax-phasedown-income-tax-cut/. Scott Drenkard, “Indiana’s 2014 Tax Package Continues State’s Pattern of Year-Over-Year Improvements,” Tax Foundation, April 7, 2014. https://taxfoundation.org/indiana-s-2014-tax-package-continues-state-s-pattern-year-over-year-improvements/.